↑ Dates in this article are according to the Julian calendar in force in England during Cromwell's lifetime; however, years are assumed to start on 1 January rather than 25 March, which was the English New Year. The Gregorian calendar counterparts are: born 5 May 1599; died 13 September 1658 (see Old Style and New Style dates). ↑ Morrill, John (2004). 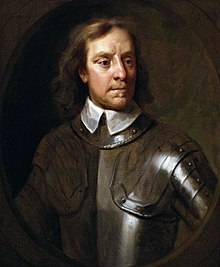 "Cromwell, Oliver (1599–1658)". Oxford Dictionary of National Biography. Oxford University Press. Retrieved 23 April 2017. (subscription required (help)).